The card measures 6" x 6". 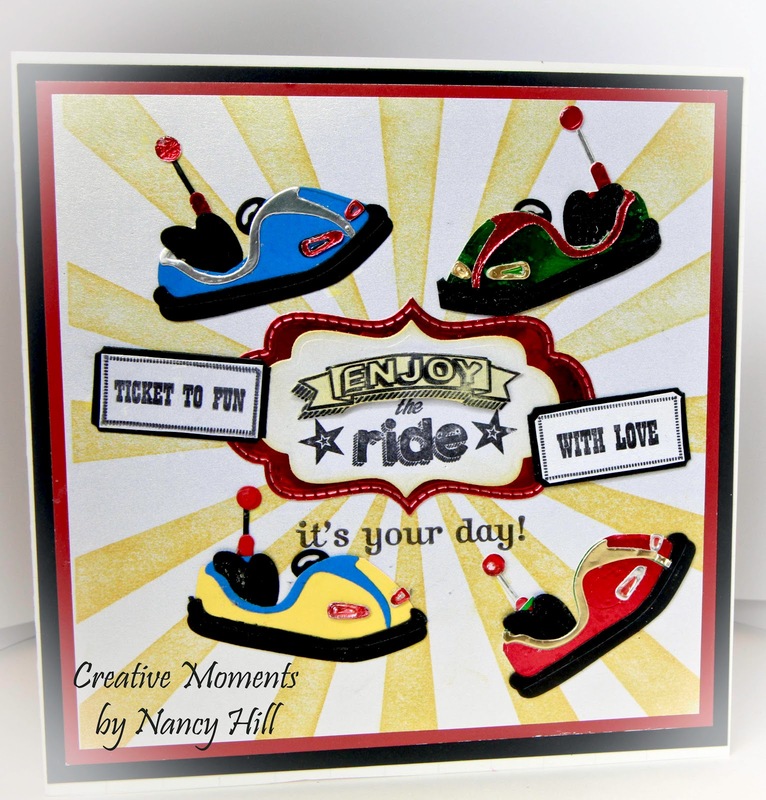 I highly recommend a stamp tool like My Sweet Petunia Misti Stamp tool for all stamping. It is worth the price. I stamped the Sun Ray background with yellow ink on a 5 1/2" square white card stock. I cut the bumper cars with metallic card stock and glued the individual parts on the card. I added NUVO clear gloss on the lights. I first stamped the "Enjoy the Ride" and centered one Frantic Stamper Bracket Labels In-Between die and die cut. I sponged Ranger Antique ink around the edges. I cut out the red Frantic Stamper Bracket Stitched Label with red metallic card stock and adhere the label die cuts together. I stamped the tickets from the Frantic Stamper Life is a Carnival stamp set with black ink and made a small border around the tickets to make sentiment stand out. I adhere the tickets to the card.